The Wichita are Native Americans of the United States who speak Wichita, a Caddoan language. They were known as the "Tattooed Faces" or "Raccoon-eyed" people because of the tattoos encircling their eyes. The Wichita formed a loose confederation on the Southern Plains, including the Wichita tribe proper and several independent bands, such as the Tawakonis, Kichais, and Wacos. They were most populous in the Southwestern United States where they ranged as far south as San Antonio, Texas, to as far north as Great Bend, Kansas. They occupied northern Texas in the early 1700s and were involved in trade with other Southern Plains Indians on both sides of the Red River and as far south as Waco. The Wichita were successful hunters and farmers, skillful traders, and negotiators. A semi-sedentary people, they lived in fixed villages notable for their dome-shaped and grass-covered dwellings and used tipis when hunting buffalo. Their numbers were drastically reduced through contact with European settlers, mostly by smallpox. Today, the surviving descendants primarily live as the Wichita and Affiliated Tribes on a reservation in Oklahoma. Efforts have been undertaken to preserve their language, although few fluent speakers remain, and culture, which contains rich and complex traditional beliefs. 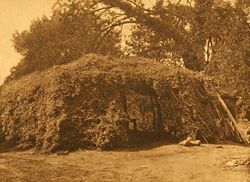 A Wichita camp. Photographed by Henry Peabody, ca. 1904. The Wichita are of Caddoan stock, separating from the Arikara, Caddo, and Comanche when they migrated into the southern plains areas of Kansas, Oklahoma, and Texas. Their first contact with Europeans was in 1541, when Spanish explorer Francisco Vásquez de Coronado encountered several villages in the area now known as Kansas, but known to Coronado as Quivira, one of the of the mythical Seven Cities of Gold. After failing to find riches among the Wichita, only maize and grass houses, Coronado departed, leaving Juan de Padilla, a Franciscan missionary, who attempted to convert them to Christianity. After three years, the Wichita killed him, apparently jealous because he began missionary efforts with another tribe. The Wichita migrated southward to the Canadian River in Oklahoma, where, in 1719, the French explorer Bernard de la Harpe encountered them. He reported that they were cannibals, but established trade relations with them. In the mid-eighteenth century the Osage forced the Wichita south and west to the Red River. The Wichita and Caddo tribes continued profitable trade with the French, selling them furs from the Plains tribes in exchange for food and other goods. However, when the French lost their territory after the Indian Wars, the Wichita lost their trading partners. In the early nineteenth century, smallpox ravaged the Wichita. Their numbers reduced by disease and conflict with settlers and the Osage, in 1835, the Wichita made their first treaty with the American government. By 1850, they had moved to Rush Creek, where, in 1858, they suffered a mistaken attack by U.S. cavalry who were pursuing Comanche raiders. 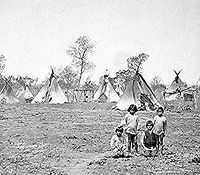 In 1859, they agreed to relocate to what became the Wichita-Caddo Reservation. During the American Civil War, they moved back to Kansas and established a village at the site of present-day Wichita. They returned to their reservation in 1867, and together with related Caddoan tribes became known as the Wichita and Affiliated Tribes. Their numbers dwindled rapidly upon contact with people of European descent. In 1790, it was estimated that there were about 3,200 total Wichita. By 1868, the population is recorded as being 572 total Wichita. By the time of the census of 1937, officially there were only 385 Wichita left. Scantily clad, with men wearing only a breech-cloth and women a short skirt, the Wichita were known to tattoo their faces and bodies with solid and dotted lines and circles. As a result they were known as Panis Piqués (Pricked Pawnee) by the early French traders and to the Pawnee and Comanche by names meaning "Tatooed Faces." They called themselves (Wichita Kitikiti'sh) "raccoon-eyed people" because of the tattooed marks around their eyes. Numerous archaeological sites located in Kansas share common traits and collectively are known as the Great Bend aspect. These sites are generally accepted as those of the Wichita and related peoples described by Coronado and other early European explorers. The discovery of limited quantities of European artifacts such as chain mail and iron axe heads at several Great Bend sites appears to support a connection with early Spanish exploration. Archaeological evidence suggests Great Bend aspect peoples practiced a subsistence economy including a mixture of agriculture and hunting and gathering. Villages were located on the upper terraces of rivers, and crops appear to have been grown on the floodplains below. Primary crops were maize, beans, squash, and sunflowers. Gathered foods included walnut, hickory, plum, hackberry, and grape. Faunal remains (bones) recovered during archaeological excavations have included bison, elk, deer, pronghorn antelope, and dog. The Wichita, like other Caddoan peoples, were primarily sedentary and agricultural. However, having migrated close to the plains, they also hunted buffalo, using tipis made of skins as their dwellings while traveling. The permanent houses of the Wichita are conical shaped, as much as 20 feet (6.1 m) to 50 feet (15 m) in diameter, made of a framework of poles covered with grass thatch. Beds were arranged inside on elevated platforms, and there was a fire-hole sunk in the center with a smoke-hole in the roof at one side. 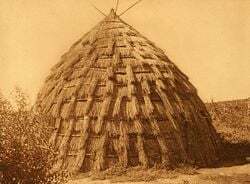 They also constructed arbors beside their houses, which provided shade and places to dry corn, buffalo meat, and pumpkin (which they braided before drying). 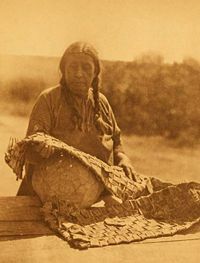 The Wichita raised large quantities of corn, grinding it in wooden mortars or stone metates, and trading the surplus to neighboring tribes. The Wichita language is a moribund Caddoan language. Only a few elders of the Wichita tribe in Anardarko, Oklahoma speak the language. However, the Wichita Documentation Project aims to produce a multimedia dictionary of the Wichita language and archive all the previous audio recordings of Wichita narratives and conversations, as well as generating new video and audio material that documents present-day speakers and current use of the language. Linguists such as David Rood worked with elders fluent in the language, recording their speech, in order to create a dictionary, and compiling recordings of traditional stories in the Wichita language before the last fluent native speakers passed on. Wichita traditional beliefs are rich and complex. Their legends include a Creation myth and several versions of a Great flood, their variations suggesting that their origins were prior to Christian influence. Their belief system includes many spiritual beings or gods, including a Creator Kinnikasus (Man Never Known on Earth), the "Spirit Over All" who represents the Infinite. In addition are the Sky gods and the Earth gods, with Mother Earth being the mother of all life and to whom man returns upon his death. The dead were buried after a mourning period of a two to four days in which the body was kept in the house adorned with paint and ornaments. At the grave site, a prayer was offered to Mother Earth and the relatives spent four days of purification, bathing themselves each day in a stream. Central to Wichita beliefs was the understanding that all knowledge comes through revelation, both for spiritual matters and material advancement. Thus, the construction of their grass houses was by divine instruction and was always accompanied by intricate ceremonial procedures. They also conducted a number of ceremonial dances, such as the Deer dance, Horn dance, and Gift dance; they later adopted the Ghost Dance. The United States Bureau of Indian Affairs officially recognizes the tribe, and since 2003 the officially recognized name became the Wichita and Affiliated Tribes (Wichita, Keechi, Waco & Tawakonie), Oklahoma. Tribe offices are located in Anadarko, Oklahoma. The Wichita tribal lands are centered today around Gracemont, Oklahoma. Their tribal roll numbers 2,011. 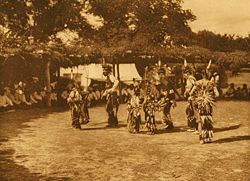 The Wichita hold joint pow-wows annually with the Pawnee, alternating between the Wichita center in Anadarko and the Pawnee in Oklahoma. ↑ 1.0 1.1 1.2 1.3 Frederick Webb Hodge, Handbook Of American Indians V2: North Of Mexico Part Two (Kessinger Publishing, 2006, ISBN 1428645586). ↑ W. Raymond Wood, Archaeology of the Great Plains (University of Kansas Press, 1998, ISBN 0700610006). ↑ Robert J. Hoard and William E. Banks, Kansas Archaeology (University Press of Kansas, 2006, ISBN 0700614281). ↑ S. E. Ruckman, Fluent speakers of the Wichita tribe down to last woman, AAANativeArts.com, 2007. Retrieved September 20, 2008. ↑ 5.0 5.1 5.2 Edward S. Curtis, The Wichita, The North American Indians, Northwestern University Digital Library Collections, 2004. Retrieved September 19, 2008. ↑ Native Americans.com, Wichita. Retrieved September 20, 2008. Curtis, Edward S. The Wichita, The North American Indians. Northwestern University Digital Library Collections, 2004 (original 1908). Retrieved September 19, 2008. Cutis, Edward S. The Plains Indian Photographs of Edward S. Curtis. University of Nebraska Press, 2001. ISBN 0803215126. Davis, Mary B. (ed.) Native America in the Twentieth Century: An Encyclopedia. Routledge, 1996. ISBN 0815325835. Dorsey, George A. The Mythology of the Wichita. Norman, OK: University of Oklahoma Press, 1996 (original 1904). ISBN 0548123829. Hoard, Robert J., and William E. Banks (eds.). Kansas Archaeology. University Press of Kansas, 2006. ISBN 0700614281. Hodge, Frederick Webb. Handbook Of American Indians V2: North Of Mexico Part Two. Kessinger Publishing, LLC, 2006 (original 1906). ISBN 1428645586. Pritzker, Barry M. A Native American Encyclopedia: History, Culture, and Peoples. Oxford University Press, 2000. ISBN 0195138775. Rood, David. "A Formula for Delaying Language Death: Wichita Language Lessons." In Proceedings of the 1992 MidAmerica Linguistics Conference and Conference on Siouan-Caddoan Languages, Flore Zephir and Evan S. Smith, (eds.). Lawrence, KS: MALC Publications, University of Kansas, 1993. Smith, F. Todd. The Wichita Indians: Traders of Texas and the Southern Plains, 1540-1945. Texas A&M University Press, 2000. ISBN 0890969523. Wood, W. Raymond (ed.). Archaeology of the Great Plains. University of Kansas Press, 1998. ISBN 0700610006. All links retrieved August 6, 2013. This page was last modified on 6 August 2013, at 17:31.